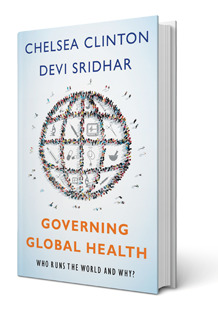 The Mailman School hosts Chelsea Clinton and Devi Sridhar for the launch of their new book, Governing Global Health: Who Runs the World and Why? To truly understand power within systems, you’ve got to follow the money. That’s part of what Chelsea Clinton and Devi Sridhar try to do in their new book, Governing Global Health: Who Runs the World and Why? Using four case studies of leading organizations—the World Health Organization, World Bank, GAVI, and The Global Fund to Fight AIDS, Tuberculosis and Malaria—the co-authors explore the financing and structures within these pillars of global health to better understand their impact. In a recent book launch event at the Mailman School, the authors explained the genesis of the book—the need for a resource that examined, compared, and critiqued issues of global health governance, transparency, and accountability. Clinton, an alumna and adjunct assistant professor of Health Policy and Management at the Mailman School, currently serves as vice chair at the Clinton Foundation in New York, while Sridhar is professor and chair of Global Public Health at the University of Edinburgh’s Medical School in Scotland. Both earned doctorates at Oxford University. The old vs. new comparisons hold true for governance structures as well: WHO and the World Bank are overseen solely by national governments and their representatives; whereas the governance boards of GAVI and The Global Fund include both state and non-state actors like private companies and NGOs. “The enfranchisement of non-state actors is something that the world has really only just begun a grand experiment since the new millennium,” said Clinton. No matter if a global health organization is old or new, they rely on both state and non-state actors for funding. And while investments in global health have grown exponentially in recent decades, the donor pool has concentrated. Following the money and understanding the power structures behind global health matters when it comes holding these powerful institutions accountable or pushing them to reform. According to Clinton and Sridhar, WHO is a particularly difficult organization to change due to its lack of transparency: it’s the only one out of the big four that does not have a transparency or open information policy. Donors, while generous, can earmark funds to certain purposes or specific regions of the world, limiting the discretionary ability of the Director-General to carry out the organization’s agenda or to deal with an emerging crisis. The roadblocks to reform at WHO came into stark relief in the wake of the 2014 Ebola outbreak as seen in their lack of readily available resources and slow response to the crisis. And though promises of change were made, so far, the authors say, very few have been realized. Current WHO Director-General Margaret Chan’s term is up this year, and the World Health Assembly will elect a new leader in May. Could this be a chance to rebuild trust among donors and the public? Is Global Health Equity Within Reach?